Harry's school topic at the moment is Transport, and with a day to fill while Ram was out running and recuperating I thought I'd gather together a few related ideas to keep them busy for a few hours. 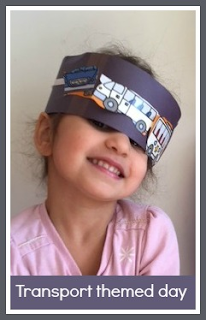 We started by making some Transport headbands with cut out pictures for them to wear during the day. I don't know what it is about headbands and crowns and so on, but children really love making them and they are so simple! I made the headband using a wide strip of black card. The children used white stickers to make road markings down the middle, then glued on some pictures of various different types of transport. These particular pictures are part of a brilliant set of cut out pictures that I bought in Tesco years ago, but see below for a fab resource from Twinkl that would also work really well. Then we looked through all their toys and books and Harry put together a little display. He managed to find examples of many different types of transport, I was quite surprised by how much we've collected over the years! He loved grouping them all together and arranging them nicely, just like they have in his classroom at school. One thing that we didn't have was hot air balloons, so next we made a hot air ballon craft, inspired by these lovely hot air balloon decorations. 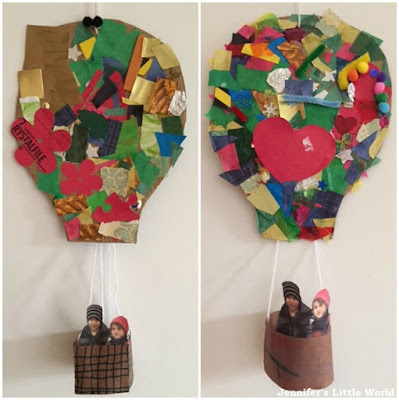 I cut a large balloon shape out of thick cardboard and the children decorated it using bits and pieces from my collage baskets (which we are still using over three years on!) A few pom poms and sequins made their way on as well. Then I printed out a photograph of the two of them well wrapped up in their coats and hats, and they decorated a basket to put themselves in and hang underneath. Although designed as decorations, they had a lot of fun playing with the balloons as well, and flying them around the house! They really liked the idea of having themselves in the balloon, but you could also print out pictures of favourite television characters, or perhaps make the basket with a sturdy bottom so that some of their little toys and characters could go for a ride. I can also always find some brilliant resources on the Twinkl website to help support topics that we are looking at. Although some resources require a Premium subscription there are plenty of resources available for free and ones that are suitable for even the youngest children. When Mia was younger she was happy with colouring sheets while Harry worked on more complicated activities, and now she enjoys the pencil control worksheets as well as size ordering and sorting tasks. Our favourite activity was the Wheels or No Wheels Sorting Activity (Twinkl subscriber resource). There is a sheet with pictures of different types of transport (which you can print in colour or black and white), then the children cut them out and sort them into two boxes - Wheels or No Wheels. Both children, even Mia, managed really well with this activity, but there are also so many ways that you could use the little transport pictures for other activities too. I remember when Harry was small searching everywhere for pictures of different types of vehicles that he could colour to make matching activities for him, and a sheet like this would have been perfect. You could also use them for the transport headbands as above. Mia enjoyed some of the Transport Colouring Pages (free download) while I played the Transport Roll, Add and Colour Game (free download) with Harry, which is similar to some of the maths homework that he is currently bringing home from school. I also printed out a Transport Word Mat (free download). 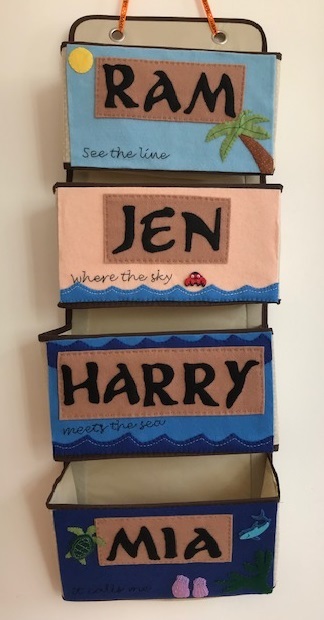 I love the word mats, they've been great while Harry has been learning to read and they are really useful if your child wants to write words related to a topic but needs a bit of help with the spelling. We also did a few worksheets that even Mia could join in with. She did some simple Colour, Trace and Connect pages (Twinkl subscriber resource) and a basic Dot-to-Dot Activity Sheet (Twinkl subscriber resource) and they both enjoyed cutting up and putting together the Transport Puzzle (Twinkl subscriber resource). Finally, our transport theme inspired me to make a Hama bead photo frame! It's so easy to do that even little ones can make it, and you can add your own embellishments like these little 3D cars. I've also made a few more Hama bead photo frames which you can see here.